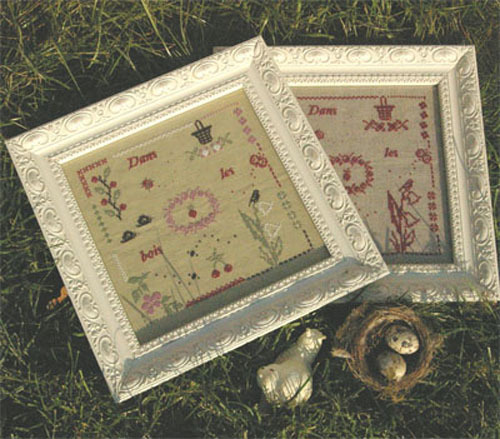 "In the Woods" is a cross-stitch chart with instructions translated in English. Please note that this design should be worked on linen or evenweave fabric as it mixes some patterns stitched with one strand of cotton over one thread of fabric with other patterns stitched with two strands of cotton over two threads of fabric. But you can choose to create your design using all the patterns in a composition of your own creation in order to avoid stitching with only 1 strand of cotton over 1 thread of fabric. You will then be able to work it on aida but will lose the proportions of the initial design. Special stitches: This is a cross-stitch design with a few back stitches. This pattern shows 5 colours (DMC references on the chart) but it can be worked also as a monochrome. The model on the picture has been stitched on a 32 count linen fabric (colour "light green") using both one strand of cotton over one thread of fabric and two strands of cotton over two threads of fabric. Recommended Fabric: 32 or 28 count linen fabric colour "Light Green" or 16 or 14 count Aida, 40x40 cm (16x16 in).